This build needed some closure, but since it has been basically finished for quite some time and it has been an ongoing "build", I will just post some of the more current pics I could find and try to at least list the upgrades that have remained a part of the bronco we call "Bruce". As can be seen since the last post I did on this project, the body has all but been removed leaving only a large part the floor, the firewall, and the frame. 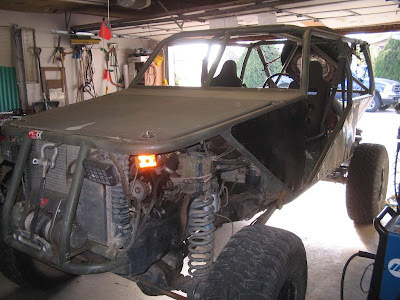 I toyed with the idea of removing everything that was a part of the original bronco all-together, but decided that I wouldn't be gaining anything by doing a large amount of additional work. Some of the recent upgrades include a Redneck Ram hydraulic steering assist that came about after breaking the pitman arm, a winchline synthetic winch line that was a fix of a broken steel line, and Chromolly axles and CTM u-joints in the front to beef things up. I also fabricated new longer radius arms using all-4-fun arms from an older bronco and 3" Johnny Joints from Currie. The new setup works good although I took some of the flex I had out to make the c-bushings last longer and to give it more stability. The rear got new tough country 6" leaf springs and a shackle flip to go from a "hanging shackle" to a compression shackle all to give it more flex and get things protected a bit more. When I did the new leaf springs I actually tucked the front mounts up on the frame because I had more lift than I wanted with the 6" springs and I wanted to keep anything I could from dragging and breaking off. The radius arm mounts got the same treatment. I also re-did the exhaust to get it up and out of the rocks. I have yet to hit the exhaust on any rocks which is a huge thing for me! I installed a fuel cell and made somewhat of a cargo rack system over the fuel cell to carry camping gear. I am very happy overall with this rig. I am ready to call it finished and go on to thinking of bigger and better things for the next project. The motor is sound and strong, the drive train is strong and holds together well, the suspension works well and is reliable, and it's fun to drive and very capable in a variety of terrain. We don't take it out and push it as much as we use to because the fam doesn't like the drama anymore, but it's ready for when we do. Here is a list of everything I can think of that seems important that is still a part of the bronco. I have tried to keep it as simple, strong, and reliable as possible, and of course it holds a family of five and all our camping gear. Custom solid front axle swap, fabricated radius arms/brackets/steering etc. Custom rear leaf spring suspension, shackle flip etc. 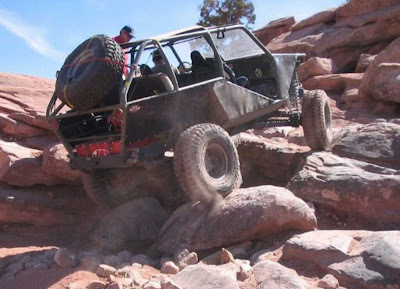 The action photo's above were taken on the rusty nail trail in Moab Utah a number of years ago. We went out with a guy we met at the camp park who showed us some new and more difficult obstacles on the nail that we had not seen before. We were able to drive up all but one which seemed to require a shorter wheelbase than what we had. The wheelbase on Bruce is around 105", roughly the same as a standard full size bronco.